I have often wondered are Christmas Smurfs more expensive in December than any other time of the year? Though I have many smurfs within my collection, I still don’t have all the Christmas themed smurfs as I always get distracted buying other smurfs throughout the year. By the time it reaches December I always feel that I have left it to late. Where does one start, when looking for Christmas themed smurfs? 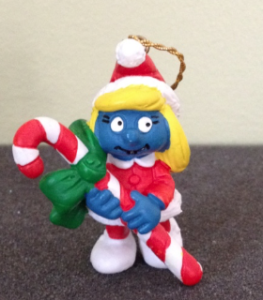 There are twelve different themed Christmas Smurfs. Released by Schleich from 1983 to 1985 and then again in 1992 to 2001. 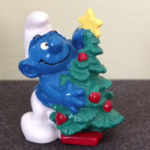 The Christmas smurfs were also released by Wallace Berrie in the USA but as they don’t appear in their catalogues I am not really when – possibly around 1982 to 1985! Now depending on how you collect your smurfs will determine which path you go down when looking out for Christmas Smurfs. 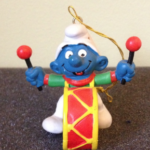 If you collect smurfs based on their markings all twelve Christmas Smurfs can be found with Portugal markings. Some can be found with Hong Kong markings, some with Portugal CE markings and some with China markings. 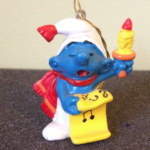 The Christmas Smurfs are sometimes referred to as the Christmas ornaments with cords. Typically the older ones can be found with their original golden cord or at least with an eyelet for the cord. The eyelet can be positioned on different positions on the smurf. A good example is Christmas Tree Smurf where the older version has the eyelet between the head and the tree. For those who like to collect smurfs with different colour variations, the Christmas Smurfs are good value because they were painted in different countries. I like the matte colour paint colours compared to the dark shiny paint colours. Santa Claus is a good one to keep a look out for, as the China version has a white pom pom on his hat compared to a yellow pom pom. Santa Claus was also made out of white or red pvc material. 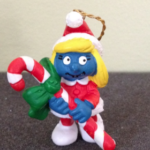 It is also interesting to note that some of the Christmas Smurfs have been produced as fakes. 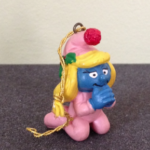 This includes Wreath (5.1906) Candy Cane (5.1907) Praying Smurf (5.1910) and Praying Smurfette (5.1911). It can be hard to tell a real from a fake and I still don’t remember all the differences. It can also be hard to tell by just looking at a picture, so buying from experienced seller such as Toydreamer can put your mind at rest. At least they can tell you when buying whether it is real or fake, so it takes the guesswork out of the equation. 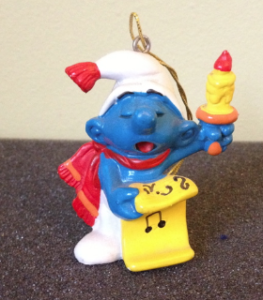 There have been other Christmas themed smurfs produced over the years by Schleich. These are just as cute and sometimes more collectible as they don’t have a whole in their head where the eyelet once sat.